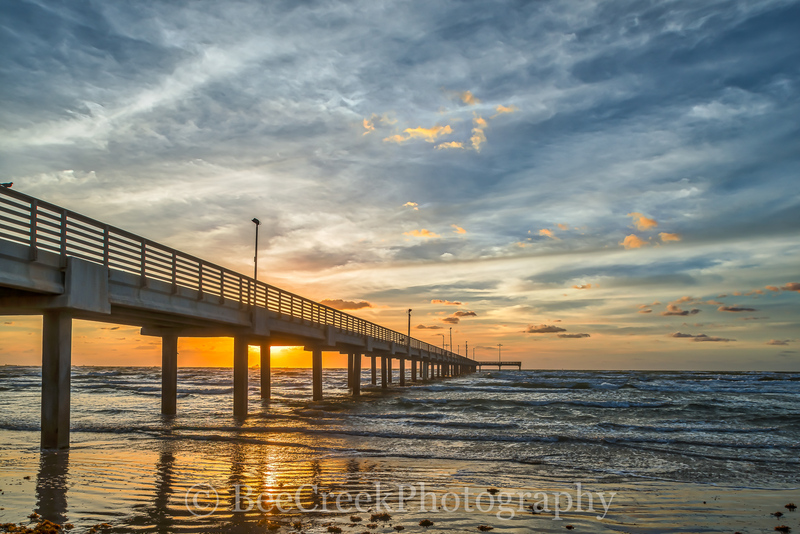 Texas Coast Sunrise - This is a coastal landscape of a Texas beach at sunrise as the sun rises over the Caldwell fishing pier on a wonderful cloudy day so that the sky was full of color. A beautiful sight of this Texas coast sunrise landscape scene on this early morning along the beach in the gulf of mexico. We loved the way the sky seemed to be painted with colors of orange, reds, pinks, blues and yellow painted across the skies from under the pier. Also these nice reflections of light danced along the waters as they surf rolled in. Photo © copyright by Bee Creek Photography - Tod Grubbs / Cynthia Hestand.